The chief prosecutor in Oscar Pistorius‘ murder trial on Wednesday urged the athlete to “take responsibility” for fatally shooting his girlfriend, telling him to look at a police photograph of Reeva Steenkamp’s bloodied head that was displayed in court. Prosecutor Gerrie Nel said Steenkamp’s head “exploded” when it was struck by one of four bullets Pistorius fired through a closed toilet door in his home last year. The photograph showed a side view of Steenkamp’s head, with a mass of blood and human tissue on the back and upper parts. Her eyes were closed. “It’s time that you look at it,” Nel said on the first day of cross-examination of the star athlete. Pistorius said he didn’t have to look because he was at the scene when Steenkamp died. Nel set the stage for a rigorous cross-examination by demanding that Pistorius openly say he killed his girlfriend, sharply challenging him when he said he made a “mistake”. The prosecutor asked the court for permission to show a video of the Olympic athlete firing a gun at a range and referring to its deadly power as a “zombie stopper”. Defence lawyer Barry Roux objected to the gun video being shown, saying it was inadmissible character evidence and amounted to a legal “ambush” of the defence. Judge Thokozile Masipa allowed the video to be shown. 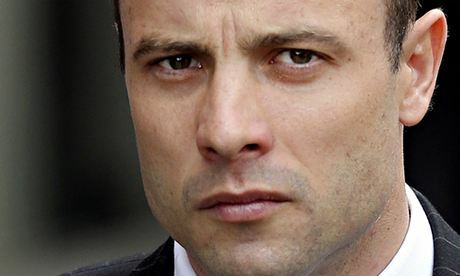 Pistorius, 27, has said he shot Steenkamp by accident on 14 February 2013, mistaking her for an intruder. The prosecution alleges he killed her on the early morning of Valentine’s Day by firing through a closed toilet stall door after an argument. Pistorius faces a possible life sentence if convicted of premeditated murder. Nel tried to dismantle the sympathetic image of Pistorius that the defence had sought to build up in three days of testimony. He opened by asking the athlete to explicitly acknowledge that he had killed Steenkamp. “I made a mistake,” Pistorius said. “What was your mistake?” Nel shot back. Pistorius then said he “took Reeva’s life”. Earlier on Wednesday, Pistorius kicked at and swung a bat at the bullet-marked toilet door, which had been placed in the courtroom as evidence. It was a re-enactment of parts of the night when he killed Steenkamp. He said he tried to kick the door down with his prosthetic legs and then bashed it with a cricket bat, an attempt to show he had tried to help Steenkamp. Pistorius described what he said were the last moments of his girlfriend’s life and how he dragged her, bleeding and “struggling to breathe” out of a toilet cubicle and downstairs to get help after shooting her in the head, arm and hip. He said she died in his arms before paramedics arrived at his house. On Tuesday, Pistorius wept and wailed while describing the moments he said he realised he had fatally shot Steenkamp. Pistorius mostly kept his composure on Wednesday, though he often paused and his voice quavered while describing what he said were his desperate attempts to help Steenkamp after shooting her. “Reeva had died while I was holding her,” Pistorius said after describing how he put his fingers in her mouth to try to help her breathe and put his hand on her hip to try to stop bleeding from one of several gunshot wounds. Posted on 9th April 2014 by newsafrica. This entry was posted in Africa, Human Rights Violations, Oscar Pistorius Murder Trial, South Africa, Women's Rights and tagged Murder, Nel, Oscar Pistorius, Pistorius, Pretoria, Prosecutor, Steenkamp, Valentine's Day. Bookmark the permalink.